Koi fish are a big commitment. Between the pond, the maintenance, and koi’s tendency to live a long life, your fish friends will require a lot out of you! But an even bigger commitment is a koi tattoo. Tattoos have skyrocketed in popularity in recent years. Over a third of millennials are now inked. Every year, the tattoo industry makes over $2.3 billion. And with the koi’s popularity upsurging in recent decades, it’s no surprise that koi tattoos are in such high demand. Tattoos are such a personal and visible way to customize your look. You need to make sure your ink reflects what you want it to. Here’s a helpful guide to koi fish tattoos. Backs are a popular location for koi tattoos. Before you make the next big step in your tattoo, take the time to learn what a koi tattoo will mean. Koi are an ancient and worldly fish. Their fossils date back 20 million years. This ancient fish was one of the earliest forms of aquatic life known today. While many think koi are a Japanese fish, they actually originated in Central Asia. From there, these carp descendants were consumed for food. Koi got their name around 500 BC in China. Legend has it that a son of Confucius was also given a fish named Koi around this time. Koi made their journey from China to Japan with Chinese invaders. The Japanese have since refined the art of koi breeding. Check out our post on the history of Japanese Koi to learn more. Koi originated in Central Asia but were brought to Japan by Chinese invaders. Sometimes called “living jewels,” koi are a highly recognizable and respected fish. Their presence in our society represents a strong interest in Eastern Asian culture. 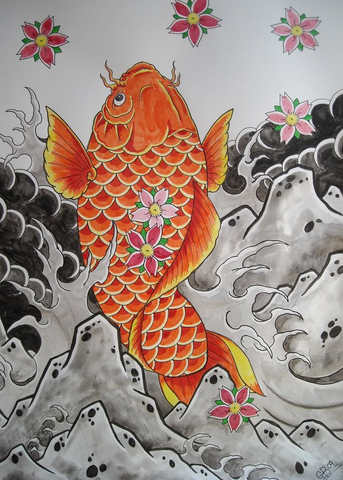 Koi fish have been a staple of Japanese folklore through the ages. One story detailing a koi’s journey upstream the Yellow River describes how the koi fought the current to leap over a waterfall. The gods approved of this heroic koi and turned him into a golden dragon as reward. Golden koi represent prosperity and wealth. Colors within koi fish can hold various meanings. If you’re considering getting a colored tattoo, know which types of koi you want inked on your body. Many colors represent familial positions: black koi for the father, red for the mother, blue for the son, and pink for the daughter. In Japan, black koi tattoos are traditionally reserved for men. 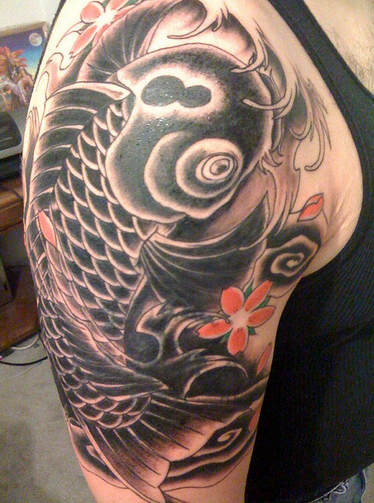 Black koi represent the father, man of the house, and masculinity. 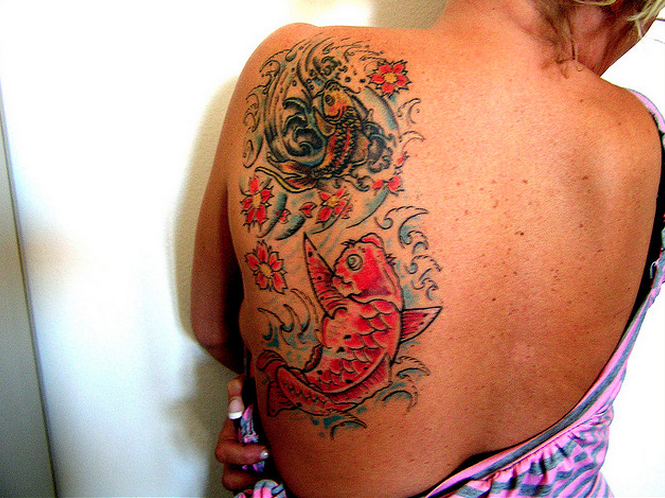 A back tattoo of koi fish and cherry blossoms. Gold koi symbolize prosperity and are a very popular color for koi tattoos. Blue koi represent tranquility. Asagi koi with blue, gray, and red coloring represent positivity in life. Ogon, a metallic koi, represents wealth. Two koi fish placed in a circular shape represent yin yang, a Chinese philosophy that. Koi tattoos placed with lotus flowers symbolize purity and rebirth. In feng shui, koi fish represent good luck and happiness. Many people get koi tattoos on their upper arms in sleeve fashion. Other popular choices are leg and full back tattoos. When thinking about a tattoo, research tattoo parlors in your area. Consulting friends who’ve had tattoos done and are happy with them is a great way to find a good artist too. Have a tattooed friend refer you to their tattoo artist. Whether you take your inspiration from traditional koi art, other koi tattoos, or even your own koi fish, make a rough sketch of a potential design. Schedule an appointment with an artist and discuss your vision, size, colors, and desired placement. Your tattoo artist will work on the sketch to make it exactly what you want. At this point, you will be asked for a downpayment. Then comes the big day. Depending on how elaborate your design is, your tattoo may be completed over a series of visits to the artist. Relax and sit back – your koi tattoo is on its way! Do you have a koi tattoo? Send us a photo via the contact form!